Haven't posted for a while because it has just been too hot to work on the caravan. I finally gave up on the wall paper idea. Even with the flooring glue the wallpaper would not stick to the PVC wall panel. After shopping around for fabric, what we ended up doing is using some curtains from Wal-Mart. Actually looks better than the wallpaper. I'll post some pictures later. 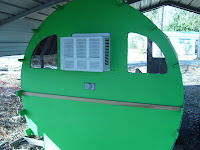 Did manage to finish the the bunk and get it painted. I have started on the bows and found that 1/4" by 1 and 1/2" pine lattice boards from Lowe's work very well. 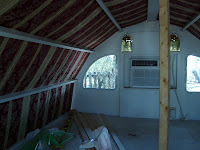 Hope to finish the bows and get the tarp on my caravan over the Labor Day weekend. More pictures shortly. Really great job you are doing. I've bought the book and am following your progress so please keep it up. Hey thanks. Been kinda lazy lately but I'm starting to get back on it.